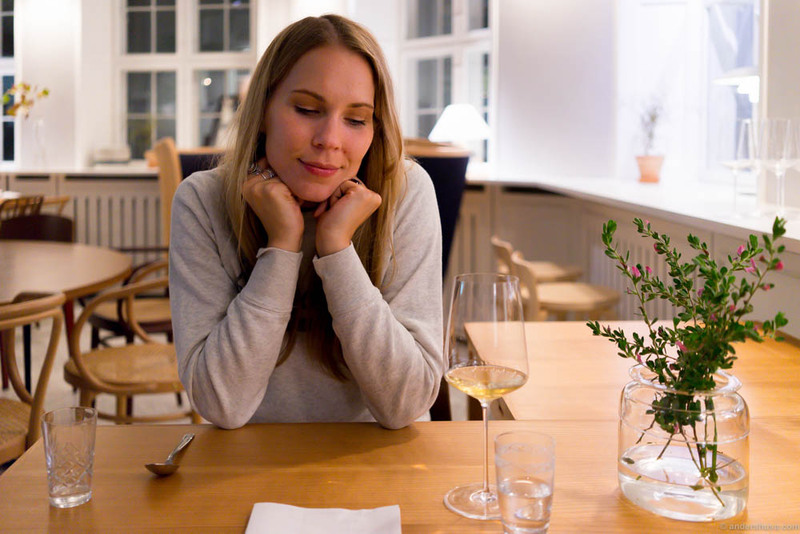 Admiralgade 26 is a new restaurant by Christian Nedergaard and Sebastian Nellemann, who also run my favorite wine bar in Copenhagen – Ved Stranden 10. In fact, the two places are located just around the corner from eachother, on the same block. A lot of new restaurants have popped up in Copenhagen lately, one more beautiful than the other. 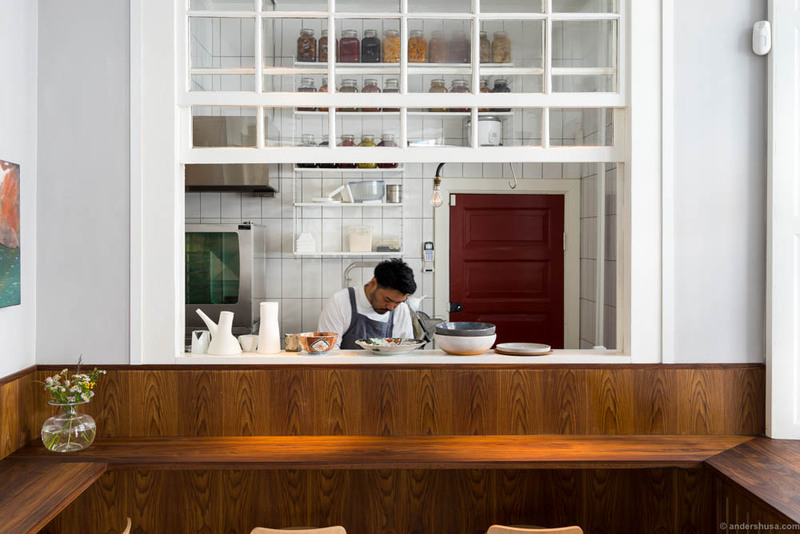 I recently wrote about Bo Bech’s latest restaurant Lou Lou and described it like a Nordic-Italian dreamland, much due to the marvelous interior design. 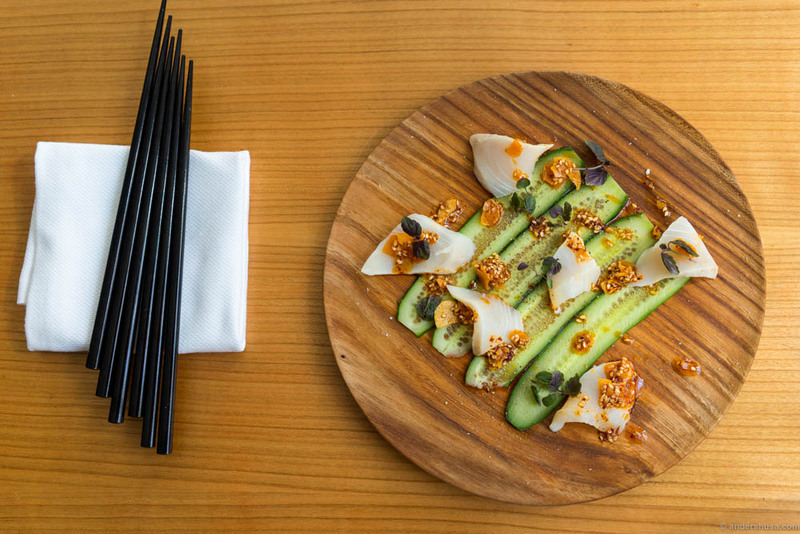 The food style at Admiralgade 26 is Nordic-Japanese with a touch of Mediterranean elements, and the interior work is no less aesthetical than either of the aforementioned venues. What’s wrong with the Danes? Not only do they cook wonderful food, but they make the most stunning spaces to enjoy it as well. 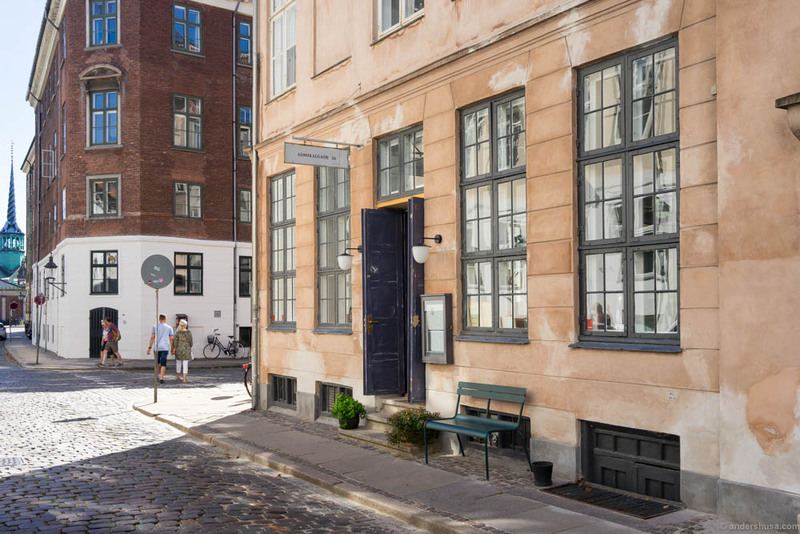 Walking into Admiralgade 26 is like entering a Scandinavian home from the early 1900s, but with an added 21st century hipster-esque way of mixing and matching different styles and cultural elements. There’s at least five different types of chairs, including Thonet’s classic bentwood chairs and two big high windback chairs that look like giant elephant ears. Spread across the room in a systematic chaos are square tables, round tables, rectangular tables and even a table designed specifically for three people. At the same time the room has the simplicity and elegance of a Japanese sushi restaurant. The flower arrangements, the ocean green conrete wall in the back and the odd looking lamps in the ceiling and in between the windows. Apparently you can enjoy a proper Japanese breakfast at Admiralgade 26. I haven’t had the pleasure yet, but it consists of lightly pickled fish, eggs, kimchi, vegetables and rice. 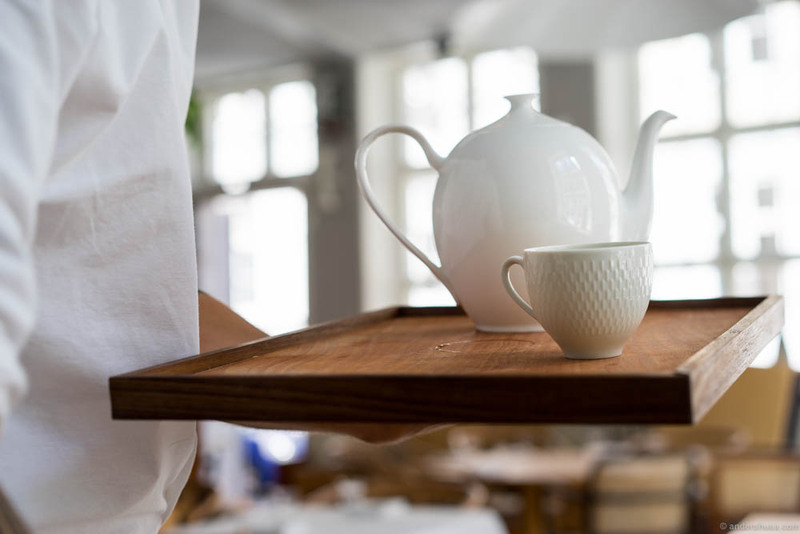 Jonas Hillgaard is the head chef, but at his side is amongst others Genzo Miyata, who probably ensures the authenticity of the Japanese influences. 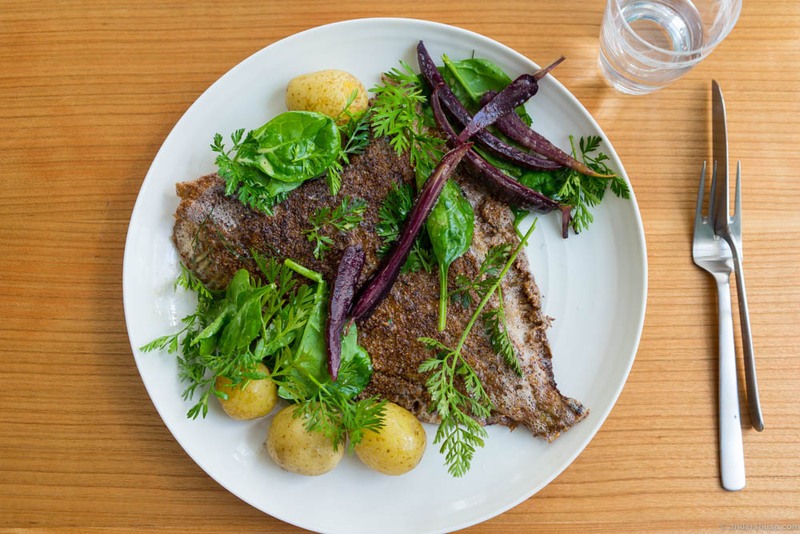 There’s also ultra Danish dishes like “biksemad” – roughly translated to a hodgepodge of mixed leftover ingredients like potato, beets, sausage and egg. My first visit to Admiralgade 26 was for lunch. By chance I was in Copenhagen at the same time as my parents, and by some weird coincidence more likely due to the aligmnent of the earth with Mars and a shooting star we had booked the same hotel as well. Anyway, my dad ordered “biksemad,” my mum got an omelette and I did a combo of mullet & cucumber and meuniere fried sole. The starter was my favorite by far. The sole was good too, but I found myself craving more butter and richness. 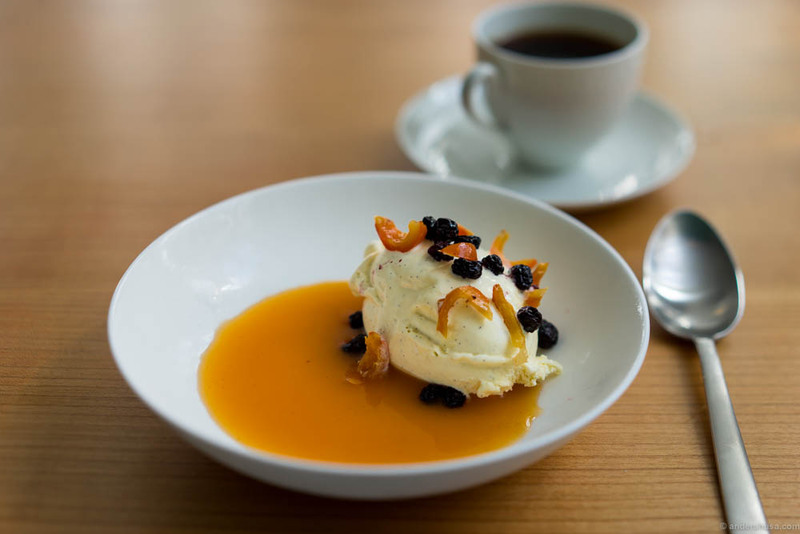 Along with the coffee we shared a simple, but pretty looking dessert of vanilla ice cream, topped with aronia berries, pickled rose hips and a coulis of rose hips. So. Damn. Satisfactory. One week later I was back in Copenhagen and the first thing I wanted was to bring Hedda to Admiralgade 26. It’s one of those places where I know we will keep going back and back again, to chill, hangout, sip a glass of wine and nibble to some snack. This evening we started with a glass of Gut Oggau at Ved Stranden 10, where we ran into a group of Noma people. A good reminder of how small this city is afterall, and especially funny since we had a lunch booking at Noma the following day. 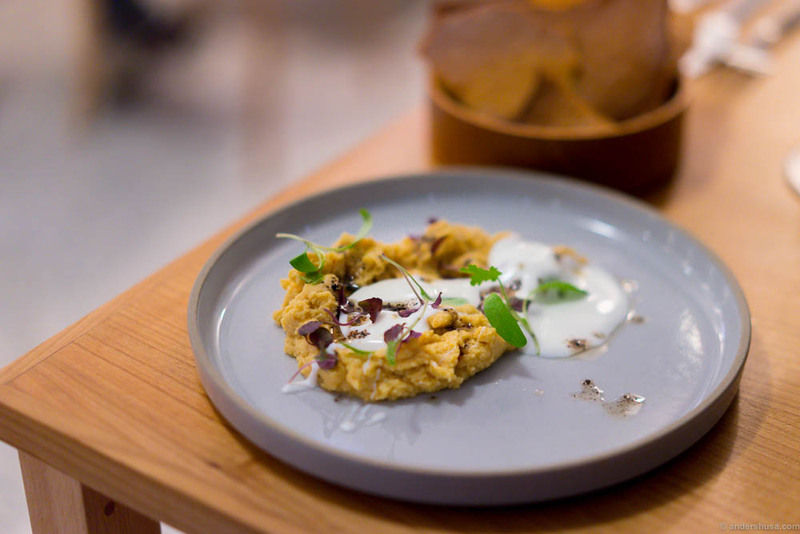 The dish that surprised me the most was the one I exected nothing from – the hummus. Served with delicious socca, a crispy flatbread made of chickpea that I had never tasted before. Our glassed were mostly filled by recommendation of the sommelier, but when I saw a Baby Bandito on the wine list I had to get one. Delicious, natural juices from Testalonga in South Africa: “Keep on Punching!” Admiralgade 26 – we’ll return before you know it! 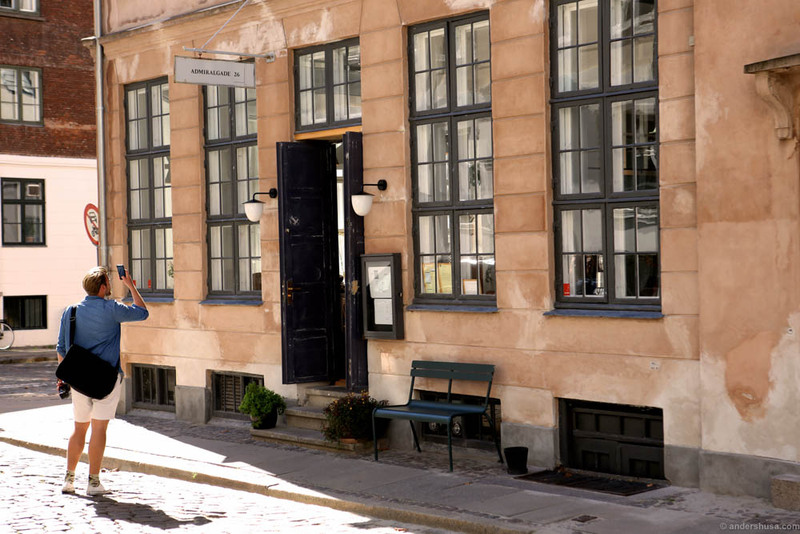 Have you been to either Ved Stranden 10 or Admiralgade 26? Please share your experience in a comment. Have you tried their japanese breakfast or not yet ? I am curious about it. Also, what kind of lens do you use for your pictures ? they look stunning! I have not, unfortunately. I want to go back for that. 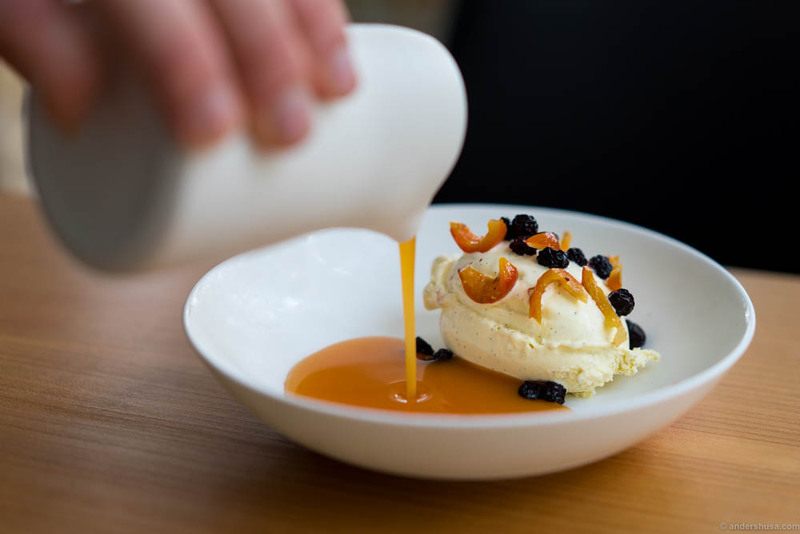 I use a Sony A7II camera and the lens is a Sony / Zeiss 55 mm F 1.8 – It’s brilliant.